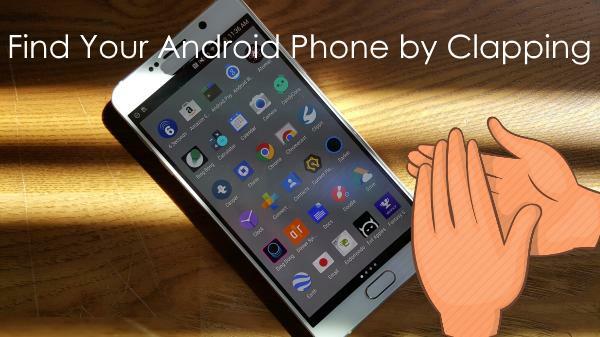 Here are 5 free Android apps to find your phone by clapping. These apps allow you to easily know where you have kept your phone or misplaced it. The interesting thing about these apps is that they don’t require your phone to have an Internet connection or enabled GPS. 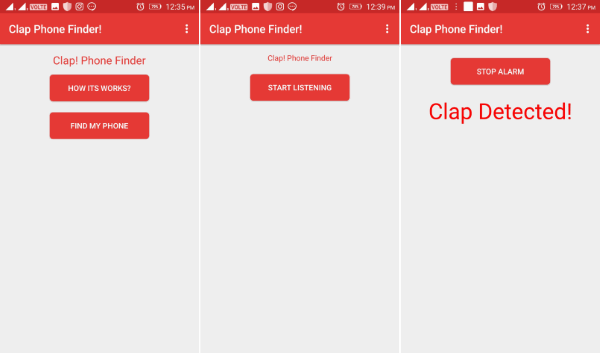 They can find the phone for you just by listening to your claps. 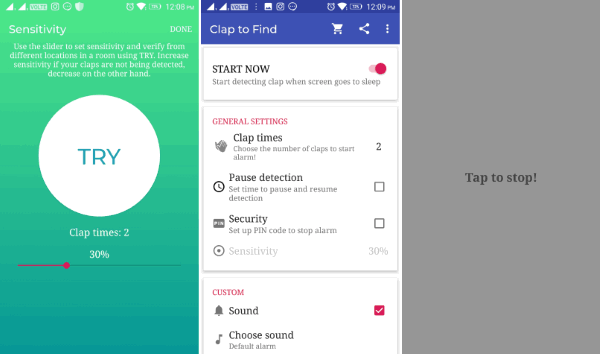 You can simply open these apps, activate the detector, and then start clapping when you couldn’t find your phone. They will then detect the claps and start ringing an alarm on your phone. Some of these apps even have the option to blink the camera flash or the phone screen. They even have various options using which you can change the alarm tone, volume, enable vibration, control option in the notification center, and more. These are pretty useful in case you have placed your phone somewhere in your room and couldn’t find it. Do note that most of these apps support ads in order to provide the service completely free. Misplacing the phone also increases the chance of your phone being used by intruders. So, you can check out these Android apps that can take pictures of the intruders when they try to login to your phone. 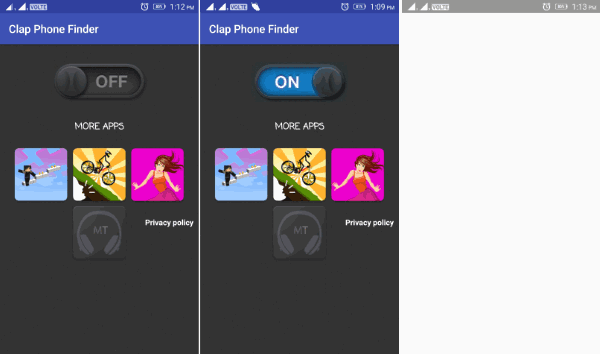 Clap To Find My Phone is probably the best free Android app that can help you find your phone by clapping. 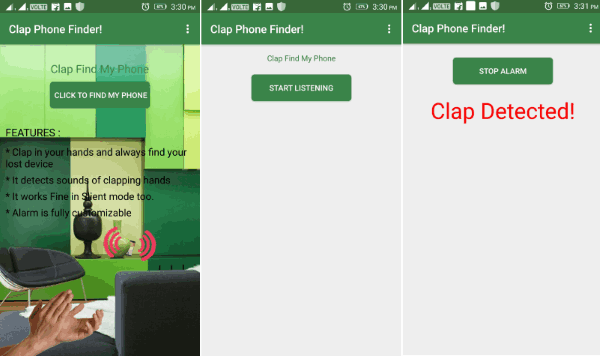 After you open this app, it will ask you to set the clap sensitivity and then try clapping twice from different locations in the room to verify the sound. Then you can proceed and enable the “Start Now” option to activate this app. Now, each time you clap twice, it will find your phone and start ringing an alarm. Apart from that, it can also vibrate, blink the camera flash, and blink the screen to let you know where your phone is. When the alarm triggers, you will see a blank screen with the option to stop the alarm by tapping on the screen. It also comes with many other options using which you can change the number of claps required to trigger the alarm, pause clap detection for any specific time, set up a PIN to stop the alarm, choose alarm sound, enable alarm pause when charging, and so on. You can stop the alarm either by clicking on the “Stop” option shown in the notification tray or tap the “Stop Alarm” button on the app. In the app settings, you can enable/disable sound, vibration, option in the notification tray, and also set the alarm tone and volume for triggering the alarm. Apart from that, it will also light up the camera flash so that you can find the phone in dark. You can stop the alarm, just by unlocking your phone and then closing the blank screen. Unlike the other apps explained above, this one doesn’t have any additional options to set the volume, ringtone, etc. To stop the alarm, you can extend the notification tray and there you will see a “Stop Alarm” option. Just tap on that and the alarm will stop. You can find various options in the app settings like enable/disable alarm sound, vibration, set alarm volume, ringtone, etc. You can stop the alarm either by opening the app and clicking on the “Stop Alarm” button or press the “Stop” option shown in the notification center. You can go to the app setting and then change the alarm tone level, alarm tone, enable/disable option in notification center, etc. 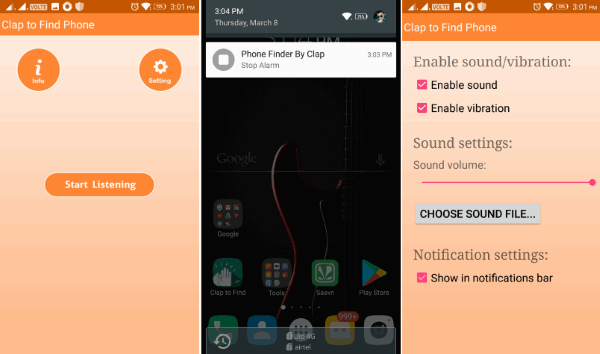 So, these are some of the interesting apps for Android which can help you easily find your phone by clapping. The best thing about all these apps is that they are super simple to use and can definitely help you know where is your phone. The “Clap to Find My Phone” app is my favorite, as it includes fewer ads in comparison to that of other apps in this post. Try them and leave your comments below.